Even as I draft this blog post, I’m still reconsidering even opening this topic up. But it’s a been long time coming. I want to talk about one of the ultimate debates in the blogging community – bloggers and PRs. So I thought I would share some insight from fellow bloggers as well as my own experiences of what it’s really like to work in blogger outreach and be a blogger at the same time. Yes I am a blogger, and yes I also work in blogger outreach. So I understand both sides. Or so I thought I did. I was under the impression that the knowledge and understanding of both sides would allow me to be empathetic to the bloggers I was working with as well as being able to deliver the best for the client I was working for. The situation I’m referring to, was when a fellow blogger decided to dedicate a whole section of her hotel review (that I had arranged) to complain about my incompetency! The main jist of it was that, the hotel were not aware of her booking as it was arranged via the central marketing team. Therefore the actual hotel did not expect her as she was booked directly and outside of their usual booking system. However, I spent a good 2 hours on the phone on a Saturday morning, on my day off, to organise a solution for her. Luckily, the situation was resolved quickly and the blogger got their complimentary stay. I also followed up personally with her to apologise and ensure she had everything she needed. And yet, I was still seen as being at fault by the blogger. An unfortunate but honest mistake on behalf of my client. But I was the one on the receiving end of the online negativity? Naturally it was hard not to take it personally, when I’m being called out in an actual blog post. I didn’t rise to it though. I replied back to the blogger and politely thanked her for the blog coverage and that I would look forward to working with her again. Yes, blatant lie. But I was trying to be professional. This post is not intended to be a finger pointing exercise. But rather to acknowledge that there are learnings to be made on both sides. In the first instance, yes, PRs working in blogger outreach can be notorious for mistreating bloggers and not providing appropriate remuneration for delivery of activity. I’ve spoken to other fellow bloggers who have an endless list of anecdotes of PRs expecting them to work for free. 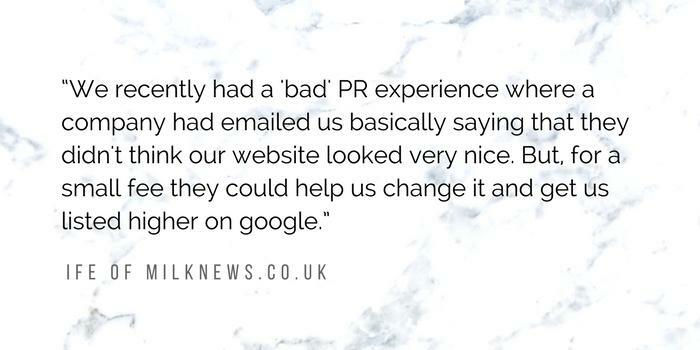 An even worse situation was when the bloggers of milknews.co.uk were approached by a company, only to be told that their site wasn’t that great. To which the company kindly offered to help them out with, all for a small fee of course. 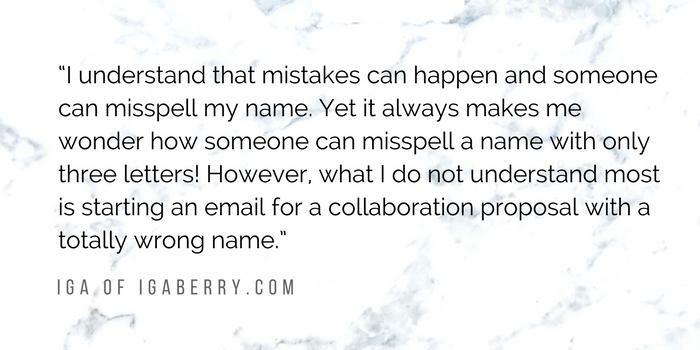 Then there’s just pure laziness, with PRs not even bothering to check what people’s names are and either misspell them or just address to the blog names. For example, my blog bio clearly has my name, yet I still get PRs addressing me as LDN. I mean c’mon, really? On the other side you also have some bloggers who can give some of us a bad name. I’ve worked with bloggers on behalf of clients where we asked for a review on their blog or coverage on their social channels. All was agreed and product was sent to them. Then, radio silence. No response after multiple emails/tweets. So despite the fact that they had received the product they refused to acknowledge any communications after that. Don’t get me wrong, I know some bloggers aren’t full-time and have their regular day jobs. But some professionalism via a simple reply in these cases wouldn’t go amiss. And going back to that* situation, that blogger didn’t have to call me out in her blog post. I was only doing my job and actually wasn’t at fault. But ultimately I was affected by her actions of writing what she wrote. Firstly on a personal level, but also as my work suffered. As this lead my client and managers to investigate my actions. In reality, this could have had a serious impact and could have even got me fired! But the blogger didn’t think about that when she wrote that up, did she? Being caught right in the middle of the debate and having seen both sides. I think there are lessons to be learnt for both. Bloggers, if we expect to be compensated for our services, then we should also be professional in our delivery. Ensure we deliver on time as agreed and also respond appropriately to clients and PRs we have agreed to work with. We should also remember the impact of our words and who can be affected by negative write-ups. PRs, we need to fix up! Stop being lazy and nurture relationships with the bloggers we work with. Know their names, make sure you have something relevant for them. Stop with the non-personalised email blasts. And lastly, if we want blogger outreach to continue to work and for bloggers to want to work with us – they need something in return too. Will bloggers and PRs always be frenemies? It goes without saying that there are benefits to having good relationships with each other. The benefits for a brand working with a blogger is clear. But there has to be a benefit to the blogger too. 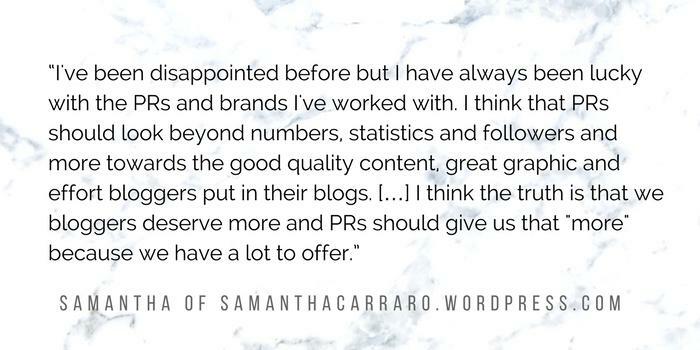 There are things we can do as PRs to ensure that we are delivering for our client but also maintaining good relationships with the bloggers we work with. Samantha suggests that it shouldn’t always be a numbers game and I totally agree. Another solution is transparency. Being clear from the outset in terms of what you want the blogger to deliver. As well as what they will receive in return is key. So what can PRs do better? Reaching out to some of the blogging community has highlighted a few simple things to consider when working with bloggers. Let’s face it there will always be friction between the two if neither are looking to achieve the same thing. But ultimately they are. Both sides should care about one thing and one thing only – creating good content to reach their audiences! I agree with everything you have said! I am struggling to get any work at the moment due to the fact in small. Probably wouldn’t even be classed as a micro blogger.. And I get emails asking me to do things for free or pay someone to help me improve my blog to gain more followers. I have also heard the other side from a girl I met at BlogconLDN and some things people expect and the way she gets spoken to is unreasonable or unprofessional at times. I know brands have hugs youtubers and bloggers that they send pr packages to and get lots of exposure from and it is totally worth it ti them. But for someone like me who genuine lly loves certain brands and products it’s disheartening when I don’t get responded to or just get a basic reply that doesn’t actually help. Some.of the brands I have received products from in exchange for reviews have been lovely but I would love to turn it in to a full time career and getting actual payment is hard.. Any tips!? I am really shocked by this. I have been a blogger & journalist for 10+ years and the booking not making it through is such a normal thing to happen, it’s entirely unremarkable. If I go to anything that’s been booked by a PR then I print out the emails so that if there is a problem, it can be easily sorted. The fact that this blogger called you out on their blog only makes them sound inexperienced, unprofessional and entitled. So please don’t feel bad about it. Just learn from it and move on, it’s all you can do right now. One thing I would ask of PRs is not to promise something and then disappear, or send out a press release and not reply to any resulting enquiries. This sort of ghosting happens regularly, and it’s such a pain in the arse to be on the other end of. I understand that there are lots of reasons why campaigns don’t happen, but being kept in the loop with info would really help, even if what you’re telling me is a no. Otherwise it just feels like you’re wasting my time, and it will put me off working with you in future. PRs would do well to remember that just because you don’t need somebody today doesn’t mean you won’t need them tomorrow. Good relationships all round are what long term careers are built on. To some extent, I don’t mind a blanket email being sent out as long as it’s RELEVANT and not just sent to a 2-year old list of bloggers who were a good fit for a campaign back then. My blog focus has changed since my family has grown up so I would expect PRs to recognise that by a cursory glance at my front page and not just because I delivered well the last time we collaborated (although good reputations are hard to come by so that nod is welcome too). As a blogger of long-standing (15 years blogging, 8 years as a community/parent/lifestyle blogger) I am utterly ashamed of some of the things I see requested and expected from bloggers these days. I’m grateful for the opportunities that blogging brings however there is an air of entitlement from some quarters. Those are the ones that spoil it for the rest of us. I wrote about blogging not being a hobby last week. It’s on the front page of my blog. I don’t want to link drop here (obviously) but it hopefully shows how much work some of us put into our blogs with little recompense. Thanks Nickie. It’s really interesting to read everyone’s feedback and opinion on this topic. Especially from someone like you, who’s been blogging for years! It’s so encouraging to hear that you’ve been blogging for that long and have evolved your blog and what you write about – gives me some hope! I hope I can keep going for that long lol. Interesting to hear that you’re not too concerned with non-personalised emails but completely agree relevancy is what’s key in these cases. Some emails I have received in the past have just been so off the mark it starts to get frustrating. I think so many bloggers these days presuming blogging is easy and so expect to be making money and contacts within 3 months when most of us took 2 years. It’s always difficult when you start out because it’s hard to tell the difference between a brand trying to take advantage of the fact that you’re a newbie or one that’s genuinely interested in you. 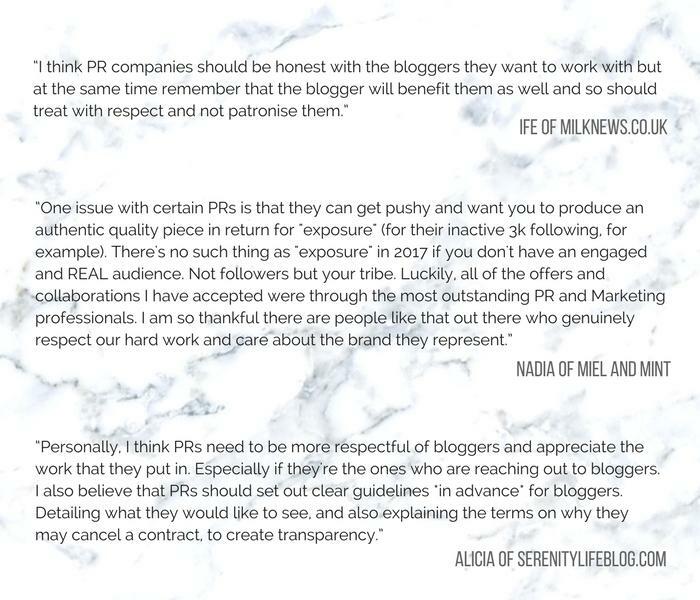 I hope people who work in PR read this post and educate their companies on how bloggers actually work and think! This is a really interesting article. I’ve worked in PR before, and I’ve worked as a journalist before… and just recently started blogging. I’m still figuring out how to best tie these various positions together (or if to tie them together at all!) and this article was really informative from a learning standpoint. So thank you ; ) I really like the honesty in your remarks and the advice from your partners. I really really love the perspective you have given in this article! It is nice hearing from someone who has been on both sides. As a new blogger, I have not yet received poor service from a PR, but am now prepared to deal with it! Also, love the background photo you have chosen to lay behind your quotes. Super cute! What an eloquently put explanation! Blogging and public relations go together. If you think of it, lots of businesses use blogs as public relations platforms. I took for granted that there may be some that do not know what I might be referring to. Essentially blogger outreach is the process in which brands connect with bloggers to collaborate or vice versa. If you’ve been blogging for that long I’m sure you’ve been approached by brands in some way or another. If you haven’t had issues with being taken advantage of then you’re lucky! Unfortunately some bloggers still do. And on the other side some bloggers also take advantage by not always working to their commitment. I’ve just tried to weigh in on both sides. I have not worked with blogger outreach programs as I have not been blogging for very long but that person posting those negative things about you was just uncalled for! If she had a problem she should let you know and not just put it all out there on the blog. Like you said it wasn’t really your mistake and even if it was people are human and can’t be expected to be perfect all the time. You were professional and resolved the problem quickly for this person but unfortunately, that didn’t matter to her. Very interesting and insightful article. I can certainly see how lazy sales tactics or lack of investigation can translate into poor relationships and unnecessary PR. I make it my goal to do some investigative research prior to reaching out to a fellow blogger or company. 1. It is a great way to get a response. 2. You come across as a professional 3. You actually get your facts right and continue to build your brand as a competent organization. What can bloggers do to help these companies get their facts right? I have noticed, getting contact information from a site is sometimes a futile endeavor. That said, if I am trying to get business from someone, perhaps I can show initiative by going that extra step and stand out from the crowd. Many different perspectives here lol. Thanks for the post, I appreciate your viewpoints! Thanks Anthony! Some great tips there. I completely agree with you it is all about research and making sure you do the best to build on that relationship. I think if you’re nice to people they are nice to you. So blasting you in their blog post says it all. Also unprofessional of them and well done you for holding your own. With the PR companies I’ve worked with I’d say that communication is key and never assume anything. List out all that you’re going to do for the job and likewise what you want from the PR/client. That way everybody is happy and no surprises. Mind you I write and video about food and drink so everyone is always happy!! Thanks Elinor, really appreciate your feedback. Agree with your points and think it needs to be clear from the outset on what you are committing to. It’s a weird one because it is all about building relationships so communication is key! Thanks Tereza. I guess that’s what I don’t understand is the negativity for ranting on your blog. I get that a review should be honest but there really was no value in writing about it in the way she did. But I guess I will just learn from it and not let people like that get me down.